If you want to lose weight and need to know what and how much to eat during this weight loss journey, here I have the solution and the perfect diet plan for a day. There are many ways to lose weight, and most of the diet plans will make you hungry and unsatisfied, and then hunger will cause you to give up on these plans quickly. And to lose weight no need to starve yourself. Indian diet is Rich in healthy and nutritious foods like green veggies, grains, lentils, sprouts, salads, and fruits. Also, Indian food dishes are famous for their vibrant, fresh spices and herbs and are of Rich flavors! Each and every spice and herb we use in Indian food dishes have their own health benefits and nutrition values. As for diet preferences, most of the people follow a primarily plant-based diet or vegetarian diet. A diet based mostly on veggies contains all the fiber, vitamins and minerals you need to be healthy. Eat breakfast, lunch, evening snack, and dinner, at least 4 meals per day. If you find yourself hungry in the afternoon, add a 5th meal(only salad/fruits). Along with diet plan you need to do exercise at least 5 times a week. It will help you to burn lots of calories and improve your metabolism. Also eating more slowly can aid in weight loss. Add regular exercise to your regimen to boost your health and weight loss even more. How to Prepare this Vegan, Gluten Free and Vegetarian (600 Calorie) Lunch/Dinner Thali? Varan-Bhat: Maharashtrian dish Varan Bhat preparation involving split moong beans or pigeon peas and rice as its main ingredients. 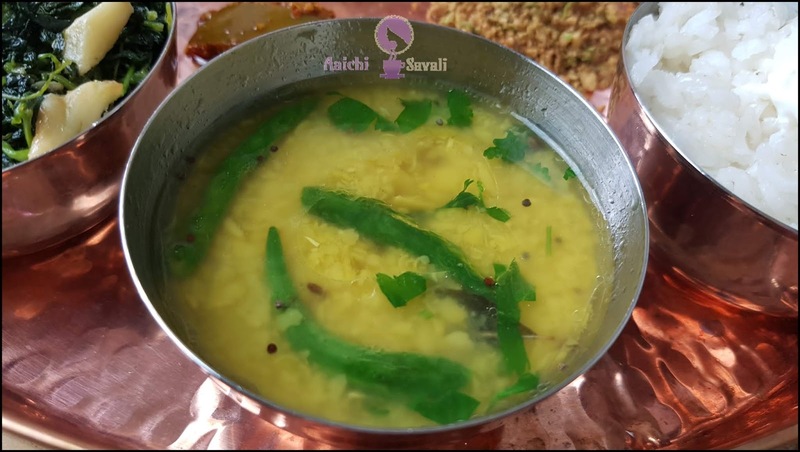 This Maharashtrian dal is a vegan, gluten-free recipe and doesn’t require the excellent preparation and lots of spices certain Indian dishes need. In Marathi, varan stands for lentils curry. Bhaat is rice. 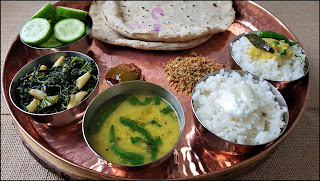 Firstly rice and split moong dal is cooked in a pressure cooker and then cooked split moong dal tempered with oil cumin and mustard seeds, curry leaves and green chilies. 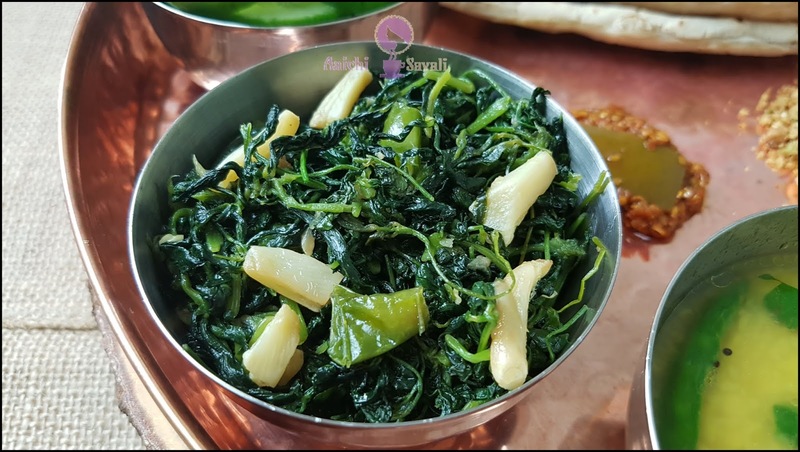 Fenugreek Leaves Stir Fry: Saute fenugreek leaves in oil, garlic, green, and salt until it cooks well. It takes 12-15 minutes of your time. Adding non-starchy veggies like fenugreek, spinach leaves, eggplants and all greens to your meals will provide a boost of fiber that can help you feel satisfied for a more extended period after eating. Each serving of fenugreek leaves stir fry provides 102 calories, 9.6carbs, 2.3 dietary fiber, 5.5 fats and 4.71 protein along with vitamins and minerals. Jowar Bhakri/Sorghum Flatbread: To prepare jowar Bhakri you need to add hot water into the jowar flour to make the soft dough which helps in rolling out easily. Then roast rolled disc on a hot pan without oil. Jowar Bhakri is rich in fiber and aids in weight loss. It is naturally gluten-free grain and an excellent source of protein, vitamins, and minerals. Kharda/Green chillies-Peanuts Chutney: It's the spicy coarse blend of peanuts, green chilies, cumin seeds, and salt. 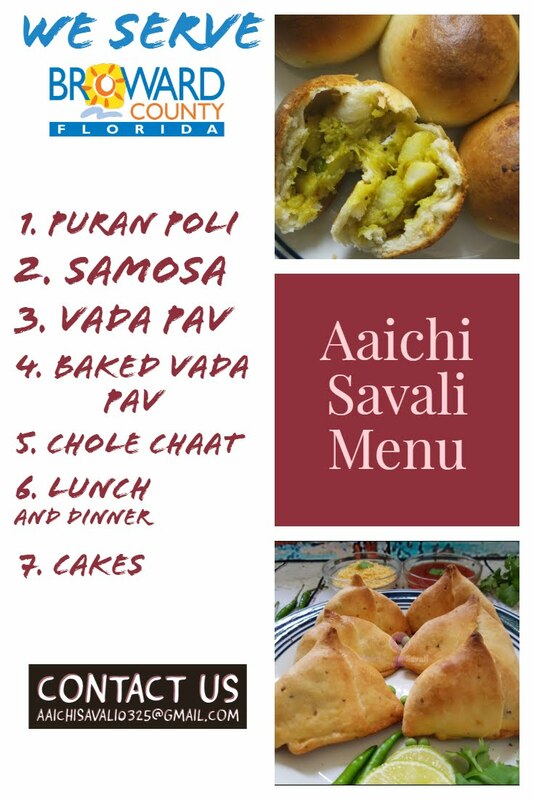 This is one of the popular dish from Maharashtrian cuisine. It is so easy to make and goes well with all kinds of Indian dishes and especially taste good with bhakri, varan bhat! Kharda is a spicy, fiery, green chili chutney. Salad/Cucumber: you need to just wash and slice cucumber and sprinkle some salt over it and serve fresh. The electrolytes in cucumber can reduce water retention. Cucumbers are low in calories and contain a good amount of water and soluble fiber, that make them aiding in weight loss. Cucumbers are a nutritious, refreshing and versatile addition to any diet. Wash split moong beans dal/ lentil and add 1 ½ Cup of water. Add turmeric, asafoetida, salt and few drops of oil. Add chopped coriander Leaves to the cooked dal and mix well. Meanwhile, heat oil in a pan and splutter Cumin-Mustard seeds, Curry leaves, Green chilies and add to the cooked dal and mix well. Pluck and wash fenugreek leaves and keep aside. Heat oil in a pan and add garlic and green chilies and saute for 1-2 minutes on medium to low flame or until garlic becomes golden color. Add fenugreek leaves, salt and mix all well. Saute and cook for 7-8 minutes or until fenugreek leaves cook well and all the water evaporated. 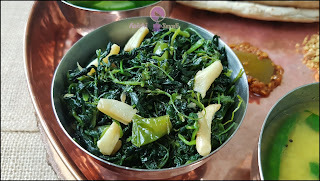 Tadaa, simple, healthy and tasty fenugreek leaves stir fry/methichi bhaji is ready to serve. Enjoy! In a mixing bowl add jowar flour and by adding hot water knead to make a dough(add water as needed). Divide dough into equal parts and make a small ball from the divided dough.Sprinkle some flour on floor or rolling board and flatten dough ball by rolling with your palms, make it a round shape. Tadaa, crispy, healthy and tasty jowar bhakri is ready to serve. Enjoy!!! In a blender/grinder add roasted Peanuts, Green chilies, salt, cumin seeds and grind to make a coarse spice mix. Meanwhile, heat oil in a pan and add grinded mixture and roast for 4-5 minutes. Wash and slice cucumber and sprinkle some salt over it and serve fresh. You can adjust the quantity of dishes according to your Calorie needs and food preferences. Per serving contains 610 calories, along with 103 g carbohydrates, 11.5 g dietary fiber, 14 g fats, and 22 g protein. It's good to eat veg. 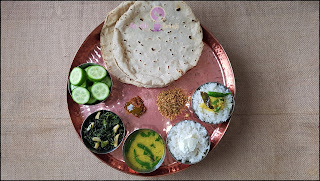 thali for lunch or dinner(for dinner you can skip rice).